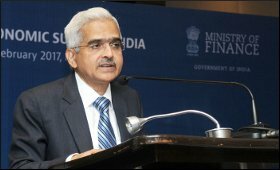 Economic Affairs Secretary Shaktikanta Das on Monday said that the theme of protectionism in trade has not been dropped by the G20 countries, though the discussion is still ongoing. "Theme of trade protectionism has not been dropped by G20. Communique says it is being discussed. Discussions will continue. Sherpa meeting is coming up, it will be discussed on official level. We need to wait for conclusion to be reached," Das told BTVi in an interview. Das had attended the Finance Ministers G20 meet at Baden-Baden in Germany held on March 17-18. He said that in the G20 Summit communique on the outcome of Presidents' and Prime Ministers' meeting held last year in China, India had explained that world trade needs to be open and anti-protectionist. Das said that a number of issues were discussed at the meeting, including global growth and the global macroeconomic situation. "IMF made a presentation and it projects that in 2017 and 2018, the global growth is expected to improve. All countries agreed to continue with structural reform measures," he said. He said that all the countries noted that India's growth momentum of over seven per cent-plus was being maintained. "It is the fastest growing economy. When we close the year, we are looking at a growth rate of 7 per cent-plus for 2016-17." Das said that at the meet, India raised the issues of inclusive growth and meeting the deadlines on automatic exchange of information in international taxation. "There was considerable emphasis by India on inclusive growth. There were discussions on international taxation. Few countries were trying to push the deadline beyond 2018-2019 for the implementation of automatic exchange of information. It was emphatically mentioned by us that timelines will have to be adhered to," he said. On climate change and fossil fuel subsidy, he said that India put forth its stand that though it was committed to these, it could not commit to a timeline because of developmental challenges.